What is the "safe saving" rate for retirement? This article was posted March 1, 2012. Last year Prof. Wade Pfau of the National Graduate Institute for Policy Studies in Tokyo published a paper on "Safe Savings Rates: A New Approach to Retirement Planning over the Life Cycle". 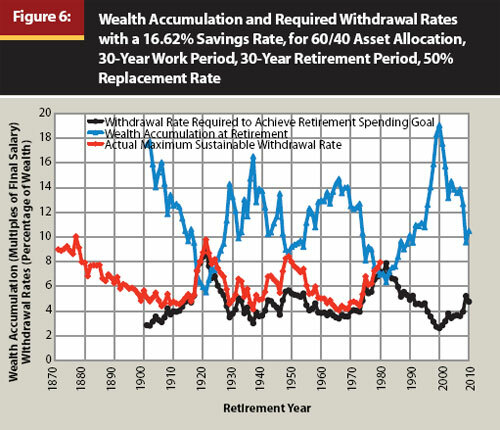 Based on his assumption of replacing 50% of the retiree's final year of employment income with a nest egg large enough to sustain a 4% withdrawal rate over 30 years, he found that the "safe saving" rate for a 30-year work period ranged from a low of 10.9% of annual salary in the best case period of high investment returns to a maximum of 37.7% of annual salary during the 30-year accumulation period with the lowest returns. Obviously, few people are going to be able to sustain a 37.7% retirement savings rate if they have less than an investment banker's salary, so this advice has little value. To narrow the gap, Prof. Pfau used the actual withdrawal rate that would have survived for each 30-year payout period examined, rather than the 4% minimum value. The results are depicted in this chart from his paper. Using the actual 30-year safe withdrawal rate (ranging from 4% to 8%) that happened to occur at the start of each historical pay out period examined reduced the maximum "safe saving" rate required to 16.6%. The only problem with this approach is that it's impossible for a new retiree to tell whether he's at the start of a 30-year period that will sustain an 8% inflation-adjusted withdrawal, or one that requires a 4% withdrawal. Caution and prudence would suggest the latter. For example, some researchers like Michael Kitces have suggested using "market value" as measured by Price Earnings Ratio to allow for a higher than 4% withdrawal rate. 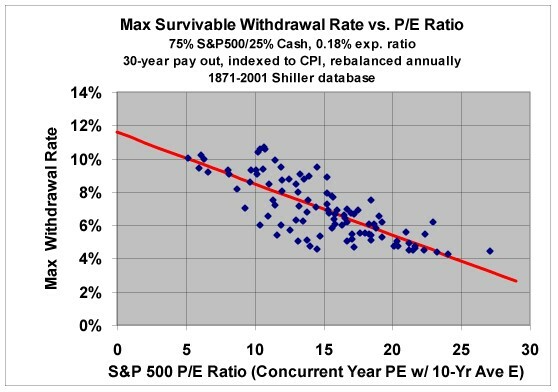 That sounds promising until you look at a plot of PE versus Safe Withdrawal Rate (SWR) (see graph below.) For a PE of 14, the SWR ranged from a low of just above 4% to a high of nearly 10%. How is a retiree supposed to determine whether the 30-year payout period he's facing is a 4% SWR or a 10% SWR? In the face of uncertainty, good sense suggests the use of the lower rate. What to conclude from this study? Prof. Pfau's work shows that the common wisdom of saving 10% to 15% of salary for retirement is likely to leave you short of the mark much of the time. The best advice is to save early and often. If you happen to do most of your saving during a period of favorable investment returns, you can retire early. A period of low returns will necessitate saving more, working longer, or accepting a lower annual stipend in retirement. If you happen to get favorable investment returns after you retire, you can boost the dollar amount of your annual withdrawal by taking 4% of the higher portfolio value using the Payout Period Reset Method. Copyright © 2012 John P. Greaney, All rights reserved.